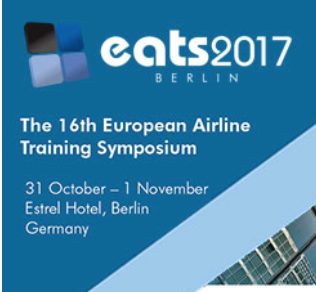 Q4 Services continues to share the news about our new DirectVue and was honored to be included as part of the online version of the Civil Aviation for Training. #Q4 is hiring. Visit https://q4services.applicantpro.com/jobs/ to learn more about our current opportunities. Comments I wil apply today Patty Q4 Services, Inc.
We're excited to be here at Army Aviation Association of America Mission Solutions in Nashville at the Gaylord Opryland Resort & Convention Center. Visit #Q4 in booth #1082 to see our DirectVue visual display system. Reach out to our sales ... Comments Wao so happy Q4 Services, Inc.
Join #Q4 at the AAAA Army Aviation Mission Solutions Summit in Nashville, April 14-16. Our DirectVue visual display system will be on exhibit at Booth 1082. 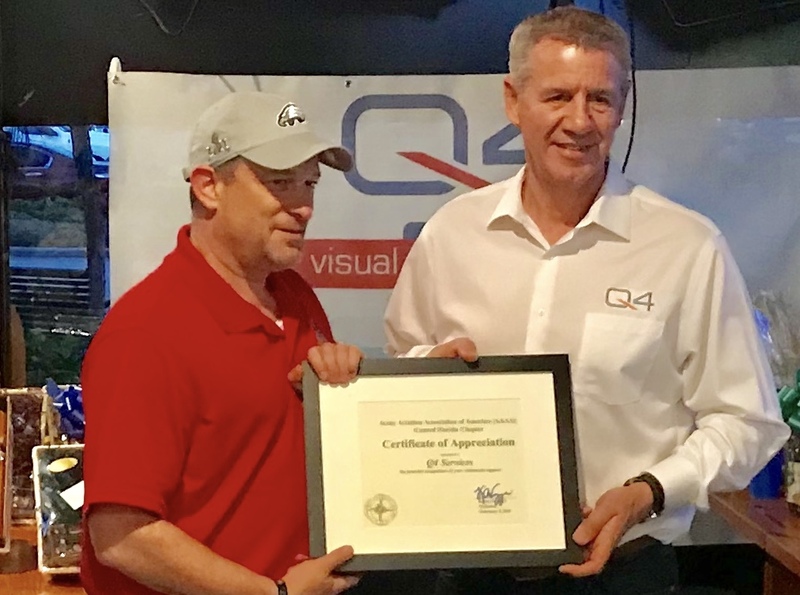 Contact our sales director, Sean Hobbs for more information about our visual displays at ... Q4 Services, Inc.
Each year, Q4 celebrates our employees at our annual anniversary BBQ. Today we are 15! We are honored to have had the opportunity through the years to provide our clients with the most innovative, high performance visual display solutions. 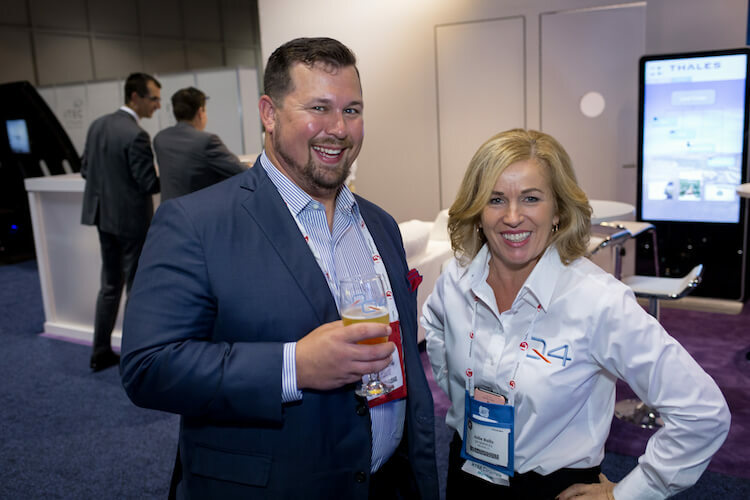 Comments Congrats Monica McKinney Ponder Congratulations Congrats Q4 Services, Inc.
SupraVue is designed specifically for the high-performance flight simulation industry. SupraVue has successfully gained the highest level of regulatory accreditation, meeting or exceeding Level D certification criteria. Check out the entire SupraVue product line at http://q4services.com. Comments Two in use wit us.. Q4 Services, Inc.
#Q4 provides a variety of high quality overhauls, repairs, updates or refurbishments for a broad product range of projectors and monitors used within the flight simulation industry. Getting a repair quote is easy. Just visit https://q4services.com/q4-services-visual-display-products/q4-crts-projectors-crt-parts/ Q4 Services, Inc.
“Just wanted to thank Q4 for an excellent job on our simulator. The conversion to the SuperPan tubes ... Comments Love British airways /q4 Hi Q4 & Ralph. Q4 Services, Inc.
Q4's Sean Hobbs attended the NDIA, Central Florida Chapter luncheon yesterday, featuring Air Force Agency for Modeling & Simulation commander, Col Robert "Hammerhead" Epstein as the speaker. Q4 Services, Inc.
#Q4 congratulates @UCF for being the new home of the Army’s Synthetic Training Environment-Cross Functional Team! The STE-CFT spearheads the Army’s efforts to modernize training, and uses state-of-the-art technology to bring together virtual and real-world environments to better prepare and ... Q4 Services, Inc. Interesting article from CNN. Microsoft’s CEO is defending the company against its own employees after executing a recent contract with the U.S. Military to provide augmented reality headsets. "We made a principled decision that we're not going to withhold technology ... Q4 Services, Inc.
Are you an experienced Project Coordinator looking for a position in Orlando, FL? #Q4 is hiring! Apply at https://q4services.applicantpro.com/jobs/1009638.html. Q4 Services, Inc. The Congressional Budget Office predicts a $4 billion increase in the Army’s acquisition budget by 2037. Of the $37 billion budget, $9 billion is targeted for research, development, test and evaluation. When it comes to innovation and R&D, #Q4 knows ... Q4 Services, Inc. It's the first day of the HAI HELI-EXPO 2019 | The World’s Largest Helicopter Trade Show and we're excited to be taking part in this amazing event. Q4 Services, Inc.
“Q4 was recommended to Airbus when one of our screens required a complete Reskin. We contracted Q4 for the ... Q4 Services, Inc.
Q4 needs a Plastic Forming Technician. Apply before March 25 to be considered. Learn more at https://q4services.applicantpro.com/jobs/1027499.html Q4 Services, Inc.
#Q4 is looking forward to attending the HAI HELI EXPO in Atlanta, March 4-7. Hope to see you there. Keep the rotors turning! Q4 Services, Inc.
Q4’s Back Projection Screen (BPS) products are specifically designed to optimize the increasing capabilities of high performance digital projectors. #TheVueFromHere Q4 Services, Inc.
On Presidents Day, #Q4 is wondering what George Washington and Abraham Lincoln would have thought about the modeling and simulation industry? Q4 Services, Inc. Happy Valentine’s Day! Comments Thank you hahahha Q4 Services, Inc.
We had a wonderful time with all of our friends and colleagues last week at the Central Florida AAAA monthly social at Frogger's! Quad A is a top notch organization and we're glad we had the chance to sponsor! Fun ... Q4 Services, Inc.
www.afa.org @AirForceAssociation recently released their 2019 priorities. First priority – Rebuild Combat Readiness in Air, Space and Cyberspace. #Q4 can help with that! Q4 Services, Inc.
Fun night at the Quad A social at Froggers! Lot of prizes for lucky winners! Q4 Services, Inc. added 6 new photos — at Froggers Grill & Bar Oviedo. Comments Congratulations Q4 Services, Inc.
Join the #Q4 Team!! We’re hiring a full-time Project Control Specialist. But hurry, the application period closes Feb. 28. To learn more, visit: http://ow.ly/bGUa50l61Dw Q4 Services, Inc. Excited to be this month’s sponsor for the Central Florida AAAA social tonight at Froggers in Oviedo 🐸! Stop by and join the fun! Q4 Services, Inc. shared a photo. Q4 Services, Inc.
Q4 is proud to sponsor the Quad A event this Friday! Come visit us at @OviedoFroggers at 4:30 p.m. Q4 Services, Inc.
Join the #Q4 Team!! We’re hiring a full-time Product Installation Technician. But hurry, the application period closes Feb. 20. 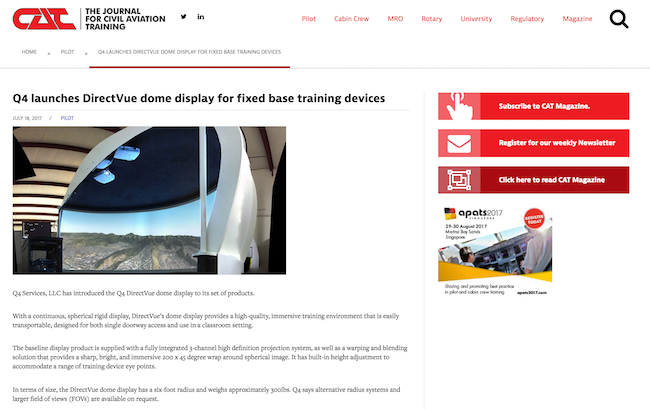 To learn more, visit: https://q4services.applicantpro.com/jobs/972211.html Q4 Services, Inc.
As this article on visionary technology describes, collimated displays represent the highest standard for visual simulation. It also asks a great question: How real do you need it to be? #Q4 Services are experts in collimated visual simulations and the ... Q4 Services, Inc. Check out this and other exciting opportunities at Q4! Q4 is an independent market-leading supplier of innovative and unique visual display systems to the military and commercial flight simulation and training industry. With its headquarters located in Orlando, Florida, ... Q4 Services, Inc.
Join the #Q4 Team!! We’re hiring a full-time Project Manager. But hurry, the application period closes Feb. 20. Q4 is looking for a Project Management professional to join our dynamic growing organization. Q4 is an independent market-leading supplier of innovative ... Q4 Services, Inc. The Rev. Dr. Martin Luther King said, “Almost always, the creative dedicated minority has made the world better.” Join #Q4 in REMEMBERING King today. Q4 Services, Inc.